Apple has reportedly run through its initial online shipment of the newly launched tablet all over the world. The dates of shipment provided on Apple’s sites have now extended to March 19, which were previously scheduled for March 16 in the United States. 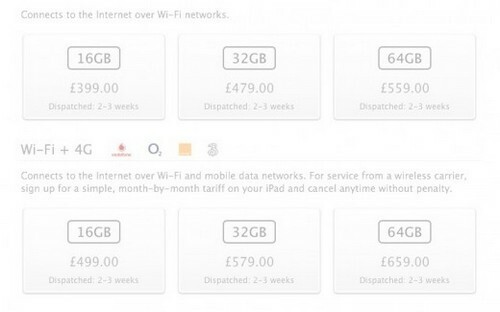 Initially, reports were surfaced claiming that the shipping dates for the 4G iPads had begun evading, and then we heard some similar reports in the UK as the shipment dates had been slipped back to March 19. Now, the latest report suggests that the shipment dates of Apple’s new iPad for the United States has also been pushed back. The report also claims that the first online batch of Apple’s newly launched tablet has sold in the United States and United Kingdom, with next batch arriving after a week. Generally, the Cupertino-based tech giant offers a huge allotment of iPads for sale in its physical stores, while lesser amount for retail partners, such as Best Buy and Radio Shack, this not at all means that it has sold each unit it made for launch day, but shows that the units allotted for its online store sold quickly. It indicates a massive demand for the Apple’s new iPad that comes with a Retina Display, 4G connectivity, improved processing as well as graphics capabilities, and several other impressive features. Apple’s new tablet is set to sell at $499 for 16GB, $599 for 32GB, $699 for 64GB. The 4G model is offered at $629 for 16GB, $729 for 32GB and $829 64GB. The device was available for pre-orders immediately after its launch and scheduled for March 16 in US, pushed back for March 19 now. The device will begin making debut in 32 other countries from March 23. Apple will continue to offer its iPad 2 along with its new iPad, but at revised rates, i.e. 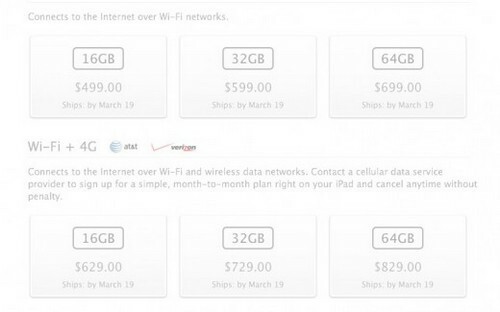 $399 in a 16GB flavor and $529 for a WiFi + 3G 16GB model.